A still from the video of a ‘hoon’ in a four-wheel drive tearing up the ground at Bulls Head. 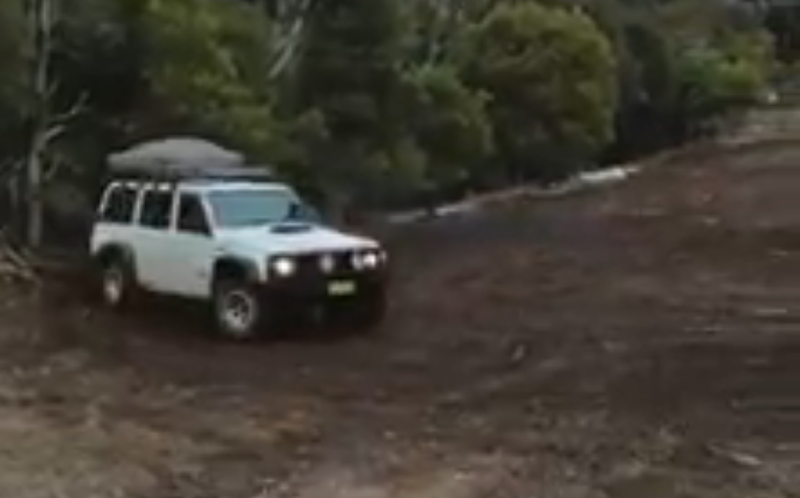 A video of a ‘hoon’ in a four-wheel drive tearing up the ground at Namadgi National Park has been posted to social media by the ACT Parks and Conservation Service as a strong warning of the sort of irresponsible behaviour that is not acceptable in national parks. The video, posted on Facebook on Sunday, has sparked heated community debate between those who think “the bloke was just having a bit of fun and not hurting anyone” and those appalled by his behaviour – including four-wheel drive enthusiasts who are accusing the driver of giving them a bad name. The driver’s details have been passed on to the ACT Policing Rural Patrol who are investigating and considering potential offences under the Nature Conservation Act. The footage (shared from Facebook below) was taken at Bulls Head – a scenic picnic spot in the park’s north – and shows a four-wheel drive doing a series of “donuts” which tear up the ground and leave it looking like mud. Since it was posted the video has been viewed around 100,000 times and sparked more than 500 comments. A spokesman for the ACT Parks and Conservation Service told Region Media that the incident occurred in May but the footage was passed on to them last week. He said that the service consulted with the ACT Policing Rural Patrol about the footage and decided to release it on social media to help get the message out about the sort of behaviour that is not acceptable for visitors to the ACT’s national parks. “We wanted to start a debate and let people know that this is not on,” the spokesman said. Regional Manager of ACT Southern Parks and Reserves, Peter Cotsell, said that the “reckless” driving shown in the footage was “detrimental to the water supply and the environment”. He said it removed a lot of the grass which can then cause problems in terms of allowing sediments to end up in the water supply. It can also create a haven for weeds, such as Californian Stinkweed, which come into the area on the tyres of a vehicle. “It’s like digging over a fresh garden and planting seeds,” Mr Cotsell said. He said they are currently trying to rehabilitate the area, with rock bollards being used to block it off while this takes place. Mr Cotsell was at pains to explain that the driver was in no way representative of four-wheel drivers who tend to use national parks “very responsibly”. “The police are looking at what action to take against that person – whether it’s a fine or a caution,” he said. “It’s a hoon person who’s got a complete disrespect for four-wheel drivers and the environment. Mr Cotsell said that the incident was not a one-off. “There’s a lot of evidence of it happening, especially around these areas. A spokesperson for ACT Policing has confirmed that the Rural Patrol is investigating the incident. “ACT Policing Rural Patrol are liaising with the ACT Parks and Conservation Licensing and Compliance Unit regarding further potential offences under the Nature Conservation Act,” the spokesperson said. Police have asked anyone who has further information about the incident to contact Crime Stoppers on 1800 333 000 (or via the website) and to quote reference 6320561.